Pomegranates are one of the oldest cultivated fruits, mentioned in the Old Testament book of Deuteronomy. Homer wrote about it and praised its taste and health benefits. A native of Persia, the pomegranate traders brought the tree to many Mediterranean countries. In Carthage and Egypt, the tree thrived due to suitable soil and climatic conditions. 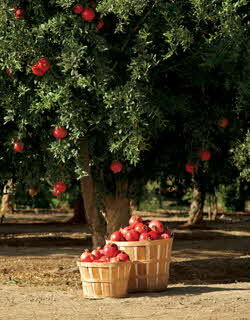 The English name of the fruit (punica garanatum in Latin) comes from French pomme grenate (seedy apple). Today the French name of the fruit is grenade. Although an old, popular and versatile fruit in the Middle East, pomegranate is only recently being promoted as a healthy fruit in the west, thanks to nutritional researchers. The juicy pomegranate is a powerful fruit that contains significant amounts of antioxidants to offset at least some of the free radicals that occur in our bodies. Free radicals occur naturally in the human body when worn out bonds that hold molecules together split apart. Polluted environments contribute to the acceleration of this process. Free radicals eventually destroy healthy cells. Normally, a healthy body can fight the process and repair damaged tissue, but requires constant and adequate supply of vitamins C and E which pomegranates and other fruits provide. Some researchers claim pomegranate juice to be as healthy as red wine or green tea. Pomegranates are a little bigger than large apples with a leathery shiny, red-yellow skin that contains innumerable red-white succulent kernels, each of which has a seed. It grows in warm regions of southeastern Europe (Spain, Portugal, southern Italy) and around the Mediterranean Sea, Middle eastern countries, Asia and Egypt. California in the U S A is a large pomegranate producer. Ancient Egyptians considered pomegranate as a symbol of fertility and used it for cooking, out-of-hand eating, and in juice form. Generally, researches agree that consuming fresh fruit is more effective than taking pills, and point out that each individual reacts to food differently. If 20 people eat the same substance, each will have a different reaction. A person may boost his/her antioxidant level for four hours, whereas another only for 20 minutes. Eating a variety of fruits becomes an important nutritional dictum. North American grocery stores always carried the sweetened pomegranate juice for drinks and cocktails, but few offered it all the time due to lack of demand. Middle Eastern and Italian grocery stores carry pomegranates in season, which stretches from September to November, but increasing demand will undoubtedly encourage fruit growers in the southern hemisphere to cultivate it. Pomegranates have a subtle acidity that renders food appealing and colourful. Persian cooks like to garnish their pilaff with dried fruits, and sprinkle on it pomegranate kernels for additional visual effect. Pomegranates stored at room temperature last four to five weeks, but longer when refrigerated. In a heavy-bottomed pot with a tight fitting lid, heat the oil. Season lamb shanks with salt and pepper; Brown lamb shanks on all sides and add the unpeeled cloves. Cover and bake for an hour turning shanks from time to time to ensure even cooking. After and hour add rosemary; If necessary add water to prevent burning. Continue cooking for another 30 minutes or longer until the meat is thoroughly cooked. Remove from oven add the pomegranate juice and stir well. Adjust seasoning. Plate and garnish with pomegranate seeds. Roasted potatoes and root vegetables are best with this dish. A Cabernet Sauvignon form Australia, or Languedoc or Washington State or Napa Valley or Bordeaux-blend a meritage wine from Ontario or Okanagan Valley would be best for this extraordinarily tasty dish.